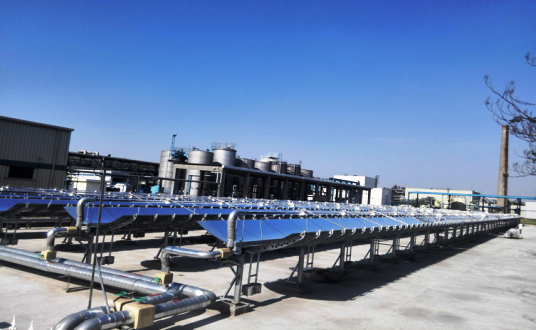 With Procter & Gamble and Siemens subsidiary Trench, Vicot Solar Technology has two prominent references in China to showcase the successful integration of solar heat into industrial processes. The plant at Trench High Voltage Products (THVP) in Shenyang (see photo) came online in November 2014 and has since been operated by THVP itself. Backed up by an oil heating unit, the system’s parabolic trough collectors with 3,255 m² of aperture area provide heat at 150 °C for processes in the electronics factory and supply the heating systems of the 33,000 m² office and the production facilities in winter. According to Vicot, the solar heat is used for space heating during the heating season and as process heat throughout the rest of the year. Including installation, total system cost amounted to Renminbi (RMB) 9.36 million (EUR 1.2 million in mid-2014) and specific costs to 2,876 RMB/m² (369 EUR/m²). The plant provides comfort for its owners: When the scheduled heating season comes to an end, the main supply company reduces the heat capacity, whether or not it is still cold outside. Whereas employees in other offices and factories will then have to deal with the cold, THVP can keep the temperature indoors at 20 °C – a plus of 3 to 4 °C. The rest of the heat is supplied by off-peak electricity. After THVS became a Siemens subsidiary in 2005, it started adopting climate protection policies, such as for solar energy use. The solar plant at Procter & Gamble in Tianjin was put into operation in March 2016. The parabolic trough collectors with an aperture area of 2,250 m² feed heat at 170 to 180 °C into a solar steam boiler supplied by natural gas. The manufacture of chemical products requires 1 to 2 tonnes of steam per hour in summer and 3 to 4 in wintertime. 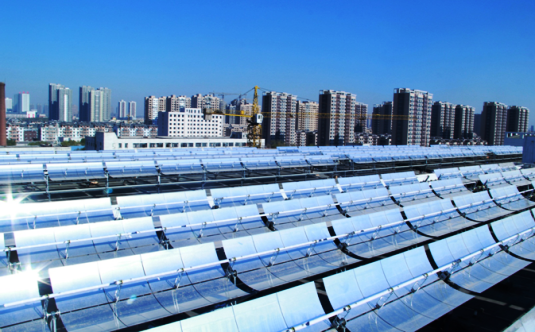 During the summer, the solar plant covers the typical load of the steam boiler. Additional steam is provided by a gas-fired backup boiler capable of producing 6 tonnes of steam per hour. The World Map of Solar Process Heat Specialists 2017 shows Vicot to have installed, all in all, 20 turnkey systems for solar process heat, with the first demonstration plant set up in 2011. The business offers turnkey services, including planning and installation, operation and maintenance, guaranteed solar yields, and can operate as an Energy Service Company (ESCO) delivering heat to customers. Additionally, it has its own factory to produce parabolic trough collectors, including receiver tubes.